The following comments about attractions in Darwin have been posted from individuals. We believe that the best reviews of Darwin, Northern Territory (NT), Australia are written by travellers and holiday makers who have experienced Darwin first hand and want to share their thoughts. Can you share yours? Please help us expand this section of our Darwin World Guide. 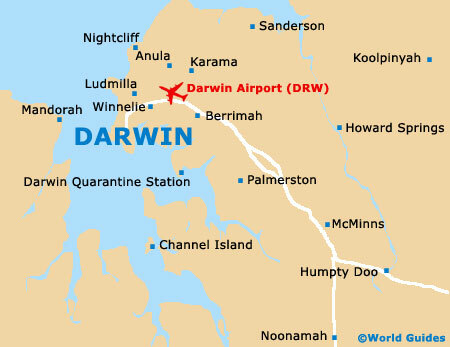 Let us know what you think about the attractions in Darwin, Northern Territory (NT) Australia. Submit comments about Darwin attractions here. The Wangi Falls are close to Darwin and the biggest waterfall in the Litchfield National Park, around 75 miles from Darwin. If you feel so inclined you can go swimming here, close to the cascading water, and snorkel as well. You will be surrounded by a tropical rain forest and nice nature trails. There is a BBQ area if you want to 'throw a shrimp on the barbie', of perhaps that's just on TV and not in real life at all. I can't think of anything niver, or romantic come to that, than a sunset cruise in Aus. Yes I can, a sunset cruise in Aus with champagne and nibbles. The views as we sailed out of Cullen Bay were lovely. We even saw a few turtles in the distance. Join in the fun on a crocodile tour (Adelaide River Experience) and see some completely wild crocs hurling themselves out of the water. There are boats of various sizes and our cruise lasted around one and a half hours. I personally would choose a smaller boat, for the obvious reason that there will be less people onboard and so you will get a more personal experience of the crocodiles. The cruise that we went on departed from next to the Adelaide River Bridge, which was not far from the Anzac Parade in Middle Point. Please note that these Darwin, Northern Territory (NT), Australia comments and reviews are posted by individuals and are not necessarily the views of World Guides.